Hi everyone! I hope you're all having a great Labor Day! I'll keep it short today with a review of the new Illamasqua The Sacred Hour Collection, not that it doesn't deserve a "long"review, it's just that a one polish post after the average 10 pieces articles I've been publishing lately feels like a day off LOL. So here we go, I have 3 products to show you : the "Facet" nail polish, "Sleek" Velvet Blusher and "Shard" Lipstick. Facet is a deep greyed-out taupe with a strong coarse golden shimmer. I thought about including a comparison with Faithful at first but this one's so much darker and cooler that it seemed pointless. I think I've probably said it a gazillion times already but I love me some gold shimmery taupes so obviously I am head over heels for Facet! Application was easy as a breeze although I must say that I was surprised by the relative sheerness of its formula. I used 2 coats in my swatches below but keep it mind that this is a 2 to 3 coater. Sleek Velvet Blusher is a semi-creme dusky coral blusher. Designed to dry to a matte velvet powder. and to offer long-lasting formulation, it proved to keep it promises with easy blend and high pigmentation. Shard Lipstick is a bold berry creme lipstick with a matte finish. Application was nice and easy, delivering lots of pigments for a long-staying formula and a "stained lips" power. 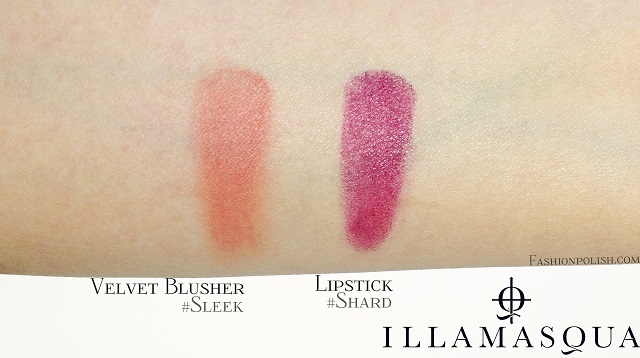 This is my first experience with Illamasqua blushers and lipsticks and although these particular shades wouldn't have been my first personal picks, they do make me want to expand my horizons. As for the Facet nail polish, it's definitely the star of the trio, pure taupe love if you ask me! How do you fell about this new collection? Anything caught your eye?